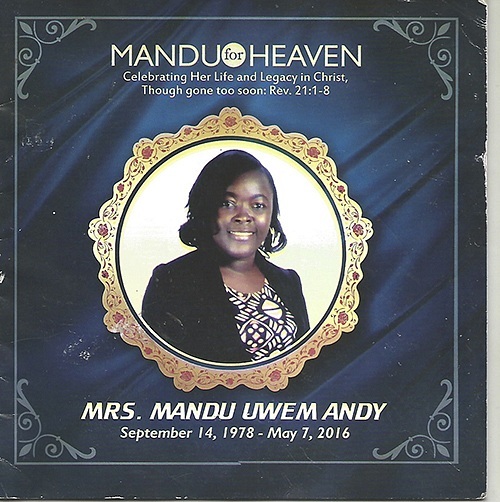 Our late and youngest Patron, Mrs. Mandu Uwem Andy passed away in a ghastly motor accident with five others on May 7 and was buried on 10th June 2016. On her birthday (14/9/2016) when she would have been 38 years old, our CE family (including our Patron in Jos, Plateau state in Northern Nigeria) gathered together to have a morning devotion and further consolation visit to her paternal family. Her late father Rev. Ephraim Udo who passed on in 2004 was a National President of Nigeria. Our CE Union is working at establishing a memorial foundation to enhance her remembrance through projects that will encourage young lives and families through CE work. We would appreciate interests from CE, friends, families and partners Worldwide. October 19, 2016, 11:07 h by Rev. M.E. Abraham. It was a great Sunday when the Bishop John Pessima, one time best quizzer for many years and presently the adviser of Sierra Leone CE Union, presented bibles to children of Faith UBC Church who participated in Bible quiz competition. We are still struggling with the Ebola. Some new cases have tested positive. 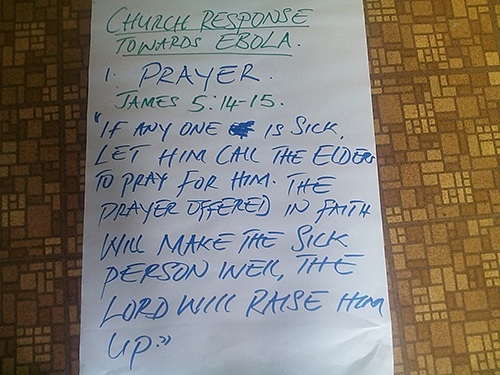 Continue to pray for Sierra Leone. The good thing this time is that the government and the international partners are on top of the situation. Some of the kids lost both parents, they need help. Pray that God will provide for them food and school uniform. We plan to have our national CE convention in February 2016. Pray for the necessary funds for our convention. November 26, 2015, 15:23 h by Rev. Sorie Kamanda, Gen. Secretary CE Sierra Leone. Greetings from Sierra Leone! To God be the glory! Great things He has done; let us continue to praise Him. In the past weeks I had the opportunity to visit Bo -, Kenema - and Bonthe districts. These areas were no go area for the past eight months but thank God that the government has lifted the travel ban; we can now travel as usual. Preparation for the reopening of schools continues. The government has appointed a committee to speed the work towards the reopening of schools in March. Kenema and Kailahun, where Ebloa was reported first, has gone over 42 day plus without any reported case. My Faith UB church has started their first children’s church. The children continue to come to the Lord every Sunday. From his report this morning the CEO of the Ebola-Centres said that the beds at the epicenters are empty; - that means the situation is under control. March 18, 2015, 07:57 h by Rev. Sorie Kamanda, Gen. Secretary CE Sierra Leone. Citizens are all trying to manage the situation by following the rules set in consequence of Ebola disease: “don’t touch , don’t visit the dead and don’t to eat bushmeat”. 49% of the country was in lock down for three days because of the virus. 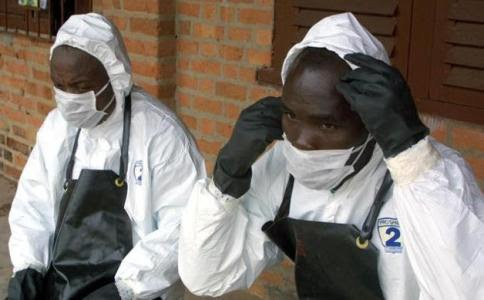 As of date Ebola has killed over 500 people and over 1,000 people were infected. Out of 130 infected children 60 had died 70 had survived. As of today, we have 1151 children in quarantined homes, out of which 261 are orphans. In these homes only rice and oil are given out to people. Basic food’s price is doubled. Many people are refusing to accept orphans in their homes because they need extra care and support. Traveling in Sierra Leone is challenging, check points are mounted all over for temperature checking. If your temperature is above 38 degrees you are taken for further checking. 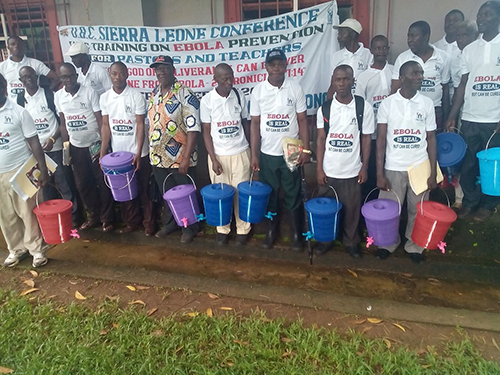 Rev Sorie Kamanda, General Secretary of CE in Sierra Leone is bringing biblical approach on Ebola at trainings to encourage people. He read James 5:14-15, I Thess. 5:11, 2 Cor.1:3-4 and Acts 4:34. If you would like to support endeavorers in Sierra Leone, donate to the WCEU account in Germany (IBAN: DE94 5206 0410 0000 8038 98 – BIC: GENODEF1EK1) or send a check to the American WCEU office (P.O. Box 723, GROVE CITY, PA 16127-0723 U.S.A). Don’t forget to mention your contribution’s purpose. Families’ unemployment is high, many people live on daily subsistence, they eat what they produce for the day. Pray that humanitarian organizations would have the capacity to meet their needs. Many homes are quarantined, the only provision they get is rice and oil. The concern for many sierraleoneans is that during the lock downs the armed robbery is spread. Pray that the security personnel would be on top of the situation. Continue to pray for my family and the thousands of children that are in quarantine. 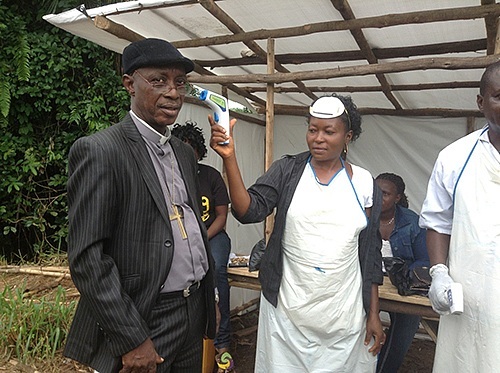 Pray for more support from the international community for the fight against ebola. October 08, 2014, 09:41 h by From emails by Rev Sorie Kamanda. You can send money for the Liberian endeavorers to the WCEU account in Germany (IBAN: DE94 5206 0410 0000 8038 98 – BIC: GENODEF1EK1) or send a check to the American WCEU office (P.O. Box 723, GROVE CITY, PA 16127-0723 U.S.A). September 17, 2014, 10:29 h by Anna Visky.